Kazunori Kataoka, Ph.D., professor of materials science and engineering at the University of Tokyo, will be the featured speaker during this year's Latta Lecture. The lecture will be at noon Friday in the UNMC College of Nursing Cooper Auditorium. The lecture is sponsored by the UNMC College of Medicine Alumni Association. A highly accomplished scientist, Dr. Kataoka is recognized worldwide in the field of nanomedicine. One of his pioneering contributions is the design of nanoparticles -- which are much smaller than a cell -- that can incorporate therapeutic drugs and DNA, for delivery and release directly to the intended site. The technology also can be used as non-invasive imaging. A growing field of medicine, nanomedicine combines engineering with the pharmaceutical and medical sciences in revolutionary ways that could more effectively deliver drugs to treat cancer, neurodegenerative disorders and other diseases. An author of more than 300 scientific papers, Dr. Kataoka's current research interests include the development of new polymeric carrier systems for drug and gene targeting. Some of his developed systems are now in clinical trials in Japan as well as in England. Dr. Kataoka received a bachelor's degree from the University of Tokyo in 1974, and a doctoral degree from the university in 1979. He served as a research associate and associate professor at the Institute of Biomedical Engineering at Tokyo Women's Medical College from 1979 to 1989. 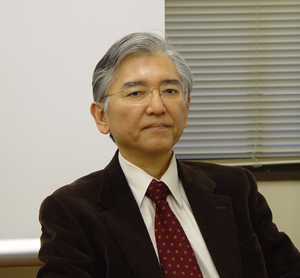 In 1989, he became associate professor of science at the University of Tokyo and was elevated to professor in 1994. In April 1998, he moved to the University of Tokyo as a professor of biomaterials. In addition to delivering the Latta lecture, he will attend UNMC's Fourth International Nanomedicine Drug Delivery Symposium on Oct. 8-10 at Embassy Suites in the Old Market. He also is one of the featured speakers at the symposium that will attract an estimated 150 participants, including other top scientists in the field of nanomedicine drug delivery. The Latta Lectureship is named after the late John S. Latta, M.D., who taught courses in embryology and histology at UNMC from 1921 until 1963. The chairman of the department of anatomy from 1940 to 1960, Dr. Latta earned the Distinguished Teaching Award from the University of Nebraska Foundation in 1957. In 1980, the UNMC College of Medicine Alumni Association established the John S. Latta Lectureship to commemorate his service to the college. Dr. Latta died in 1989 at age 94.